My first memory of the Algarve is a beaming face and wrinkled-hand passing me a freshly-picked orange. I quickly peeled and devoured what at the time tasted like sweet, juicy heaven sat against an almond tree and, twenty-five years later, I still smile at that moment every-time I step off a flight at Faro airport. In many ways, a lot has changed in the two-and-a-half decades since; more resorts, more tourists, fishing villages that have developed so much you wouldn’t recognise them in an old postcard. On the other hand, it’s still just the same. Beaming, wrinkled-faced ladies sell oranges from roadside stalls, Arabic castles share the history of the region, and small cobbled back-streets restaurants serve up traditional chicken Piri-Piri, clueless that a famous chain is hawking the same thing for three-times the price elsewhere. The biggest change? I’m now lucky enough to call this home, and those sweet, tasty oranges are an every-day occurrence. 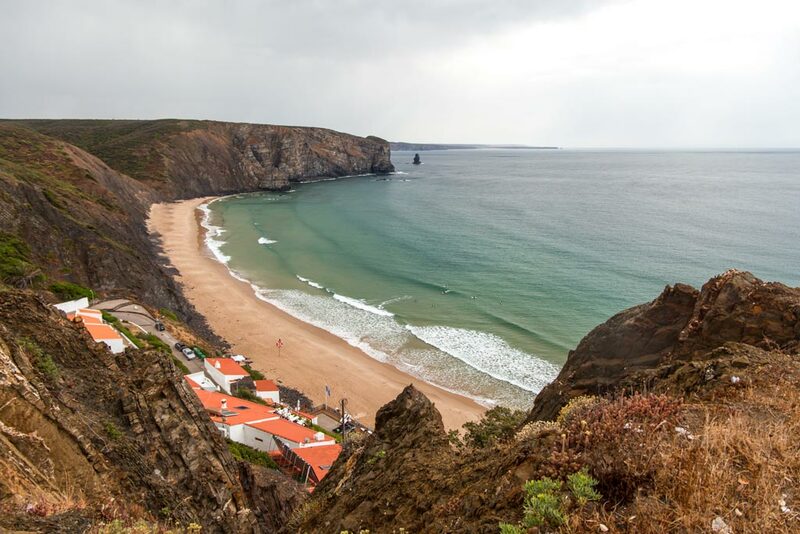 You might picture the Algarve as boozy brits and big resorts but believe me; you don’t have to stray far to discover quaint beaches, lakes with dancing flamingos or mountainous spa-towns. Here are a few of my favourite Algarve hidden gems from nearly a lifetime of exploring this sun-kissed part of Portugal. 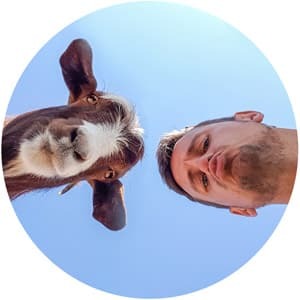 And if you are looking for somewhere to stay in the south of Portugal with a twist, check out my list of unique and unusual accommodation in the Algarve. Take a video tour of a few of my favourite spots in the Algarve, with a slice of Lisbon thrown in for good measure, and then discover more by scrolling down. 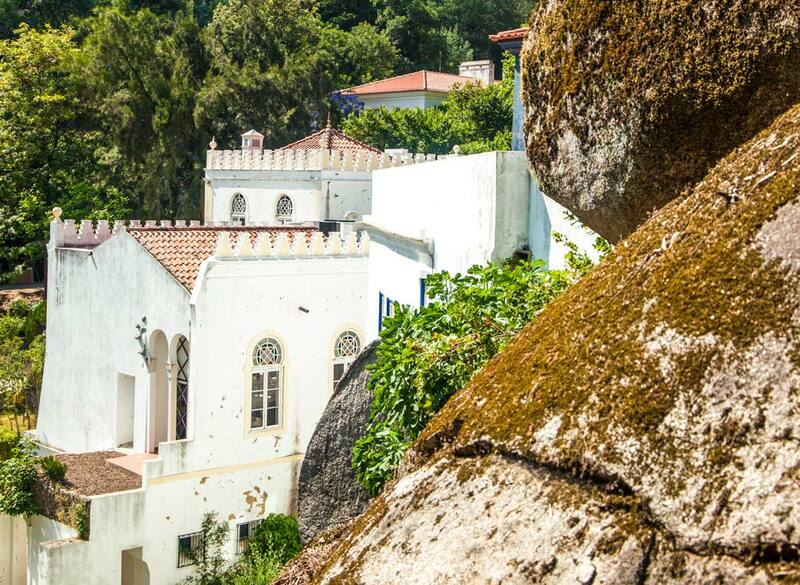 Silves provides the perfect mix of history, culture and cuisine. Once the capital of the Arab kingdom here in the Algarve, its well preserved red castle, perched above the colourful streets and squares below, is still the largest in the region. Surrounded by green hills and orange trees, Silves town has an impressive local market, an ancient Mosque (converted to a church) which boasts both Gothic and Baroque features and plenty of traditional coffee shops lining its small cobbled streets. 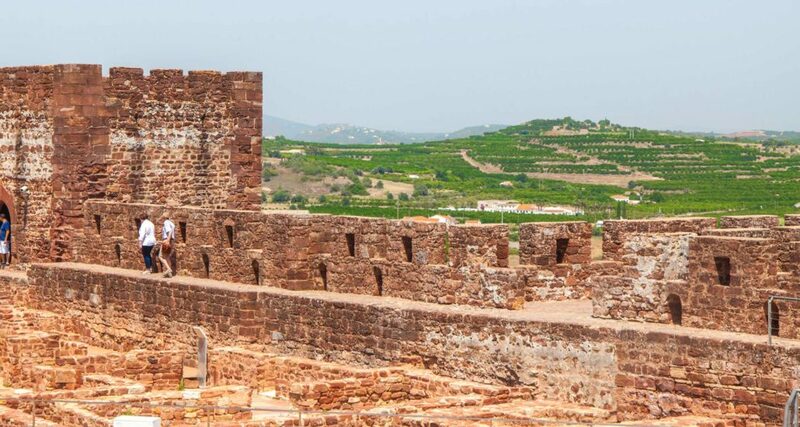 It feels a world away from the bar filled roads at the beach resorts and its best explored during August when The Silves Medival Festival takes place. 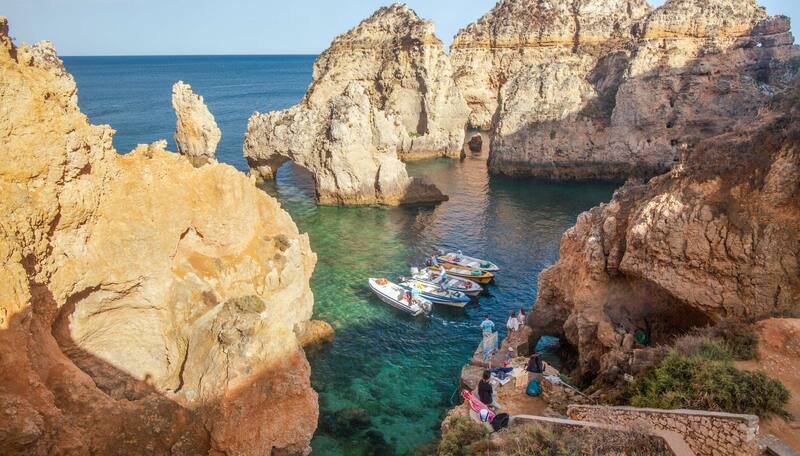 Along the coastline of Lagos, you can get lost in a maze of caves and Ponta da Piedade are my favourite in this white-washed, bustling town. Drive slightly away from the centre, and these honey-coloured cliffs against the clear waters make for a water-sport lovers playground. For those who want to sit back and enjoy the ride take the stairs strewn into the cliffs and jump on a local fishing boat for a slow-paced tour. 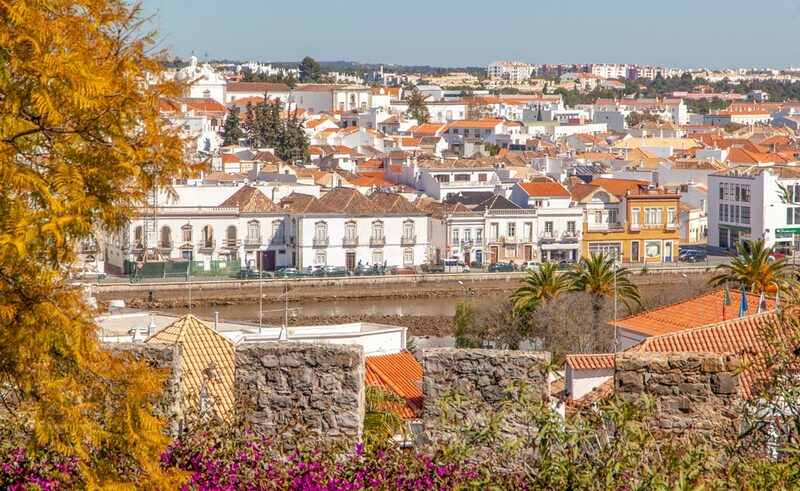 Moorish history comes alive in Tavira where the Maria do Castelo church is home to knights tombs, and the medieval castle has panoramic views of this small city. The river running through is an extension of the nearby nature park and flamingos can be found dancing through the salt flats in season. The cobbled streets and long stretches of sandy beaches nearby make this an excellent base for exploring the Algarve, and thanks to the more traditional vibe here, it provides a more authentic Portuguese experience. 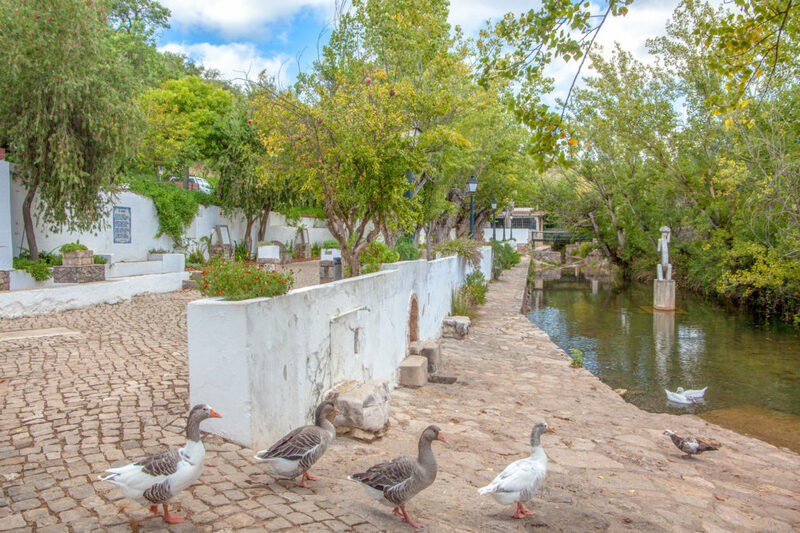 A short drive from Loulé is the small village of Alte which offers a great insight into a slower paced and local way of life. If you head away from the coastal resorts then traditional Portuguese dishes, with traditional Portuguese prices, are a welcome rest-bite from the samey and expensive menus that ply the main drags of the region. The nearby waterfall, although small and now sometimes lacking in water, is a pleasant hike outside the harsh heat of the summer months. Just outside of Faro is Estoi, a small parish which houses Roman ruins in Milreu but also one of my favourite restored buildings in the region. 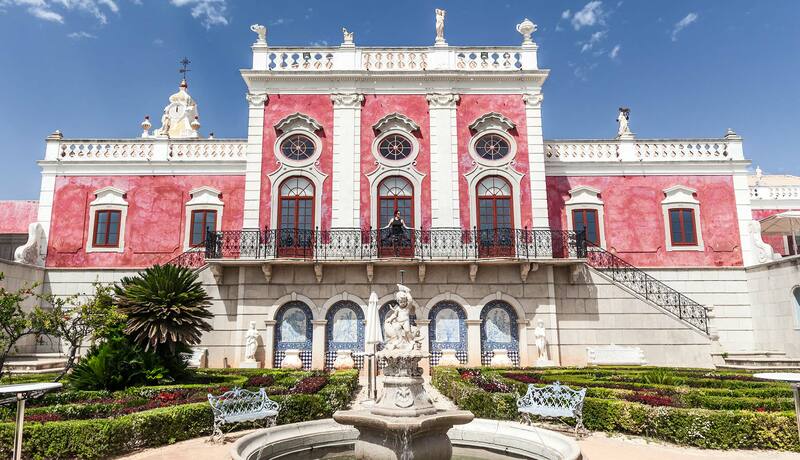 The Pousada de Faro, once in disrepair, has now been renovated inside with the grounds following suit as part of a luxury hotel renovation project which is bringing many historic buildings back to life in Portugal. You don’t have to be a guest to explore the main rooms and grounds of this 18th-century palace although a chilled glass of wine on the veranda comes with a slice of grandeur you’ll struggle to find elsewhere in the Algarve. If you want to experience the Turkish baths and boutique luxury, you’ll need to book a room. The colourful streets of Loulé, with a central location, is another excellent base in the Algarve for those not wanting to stay at a beach resort. As with much of Portugal, the biggest joy comes from aimlessly wandering the stone alleys while grabbing coffees and pastries at suitable intervals. The reason I love Loulé so much is, as of yet, tourism hasn’t completely pushed out the traditional way of life, and many of the residents are locals. 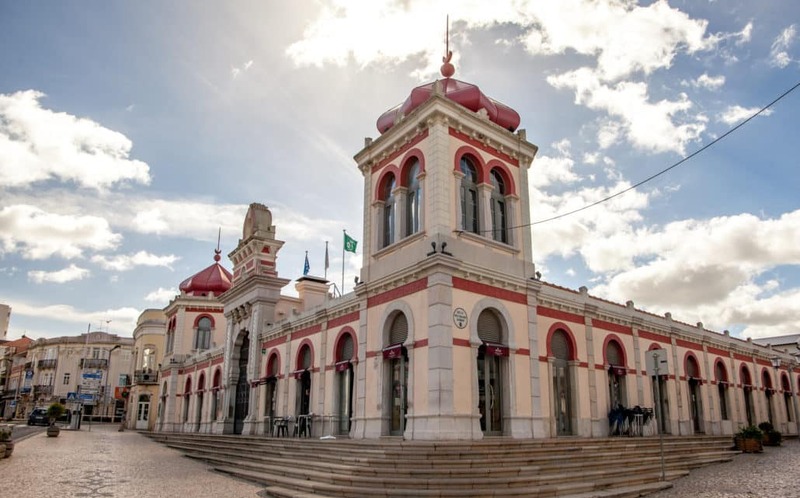 The town-centre has some great shops, a castle and a vast local market, and in general, it’s a chance to see the Algarve not washed out by visitors. If you are around at the end of June or early July be sure to check-out the Festival Med when a whole host of musical, cultural and art based events take over the town. This ruined church and fortressed walls from the 16th century isn’t much to look at anymore, but the stroll passed the nearby mill with little turtles in the river is a pleasant break from the beach if you have a car. Take the two-hour trail past the medieval bridge to get a little insight into the long history along the south of Portugal. The beach itself is one of the most famous in Portugal and with its striking appearance you can see why, but my favourite part of coming here is the clifftop walk above it. Multi-coloured rocks litter the walking trail to epic viewpoints, and Instagram lovers are now starting to flock to take the heart-shaped photo of the rocks (as you can see from my picture, I didn’t quite know this at the time). It’s a great spot to park up the car and eat a picnic lunch looking out on the Atlantic. 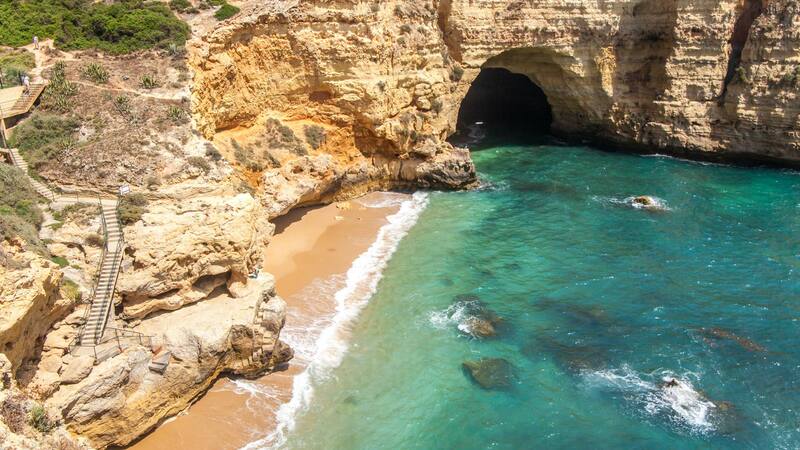 Without a doubt one of the most famed photo opportunities of the Algarve, the Benagil caves can be accessed by boat from various stops along the coast, although Praia de Benagil is the closest. You can swim from this beach into the caves although it’s not advised with the currents and tragically there was a death nearby in recent years as a boat collided with a swimmer so, please don’t. Inside the cave, you’ll be wowed by the sunlight from the hole in the roof illuminating the lapping waves inside. Although the population of this small fishing village is minuscule, it has become an increasingly popular tourist spot to sample ‘authentic Portugal’. How authentic it is now is questionable, but step away from the main square to visit the ornate interior of the church before lounging on the beach with a small castle (now, I believe, a private home) above. From here boats cross the river to the favourite tourist spot of Praia da Rocha where beach club, No Solo Agua, is an excellent sun-downer spot before hitting up the late night parties. This municipal park is a popular spot for us locals to escape the beach and enjoy a picnic lunch surrounded by nature. The 12+ picnic tables quickly get busy on a sunny day and the six BBQs are availble to use, just bring your own coal and cooking tools. The old-water wheel, an amphitheatre and millars house are the main ‘sights’ but the park plays host to various wildlife and birds with flamingos being a welcome addition during the season. Estombar is a small, but it does have a train station which can make it more accessible to those without a car. If you are visiting in the summer months, then some of the local springs here may have dried up, but if respite is your thing, then the ancient health resorts in Caldas de Monchique is a great place to check-in. Surrounded by dense trees and huge rocks, this elevated part of the Algarve is entirely different to the coast and is a good spot to stop if you are planning to drive to the Alentejo region next. Make sure to bring your re-refillable water bottles to take water straight from the springs here. 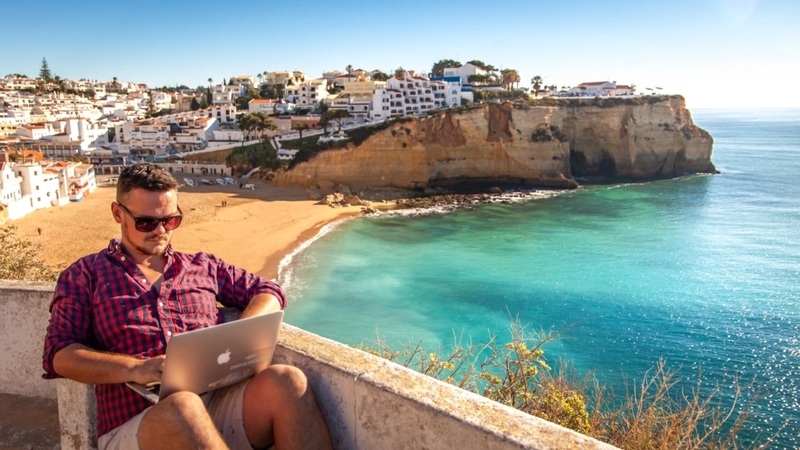 I’ve been lucky enough to call Carvoeiro my second home for most of my life and this little village, with a small but perfectly cliff-flanked beach has become the poster-child for the Algarve of late. 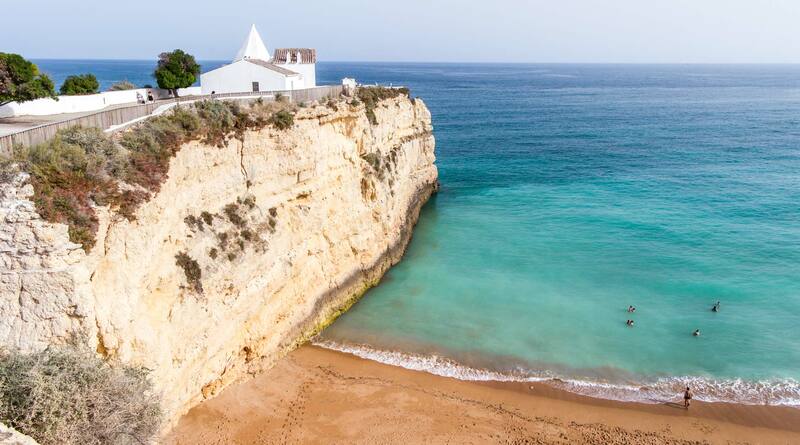 Walk up the hill to the left of the beach where a little church marks the starting point of the Carvoeiro Board Walk, a wooden path hugging the cliffs. Climb down into Algar Seco for rock pools and craggy formations or just to take a glass of wine at Boneca bar buried in the rock. 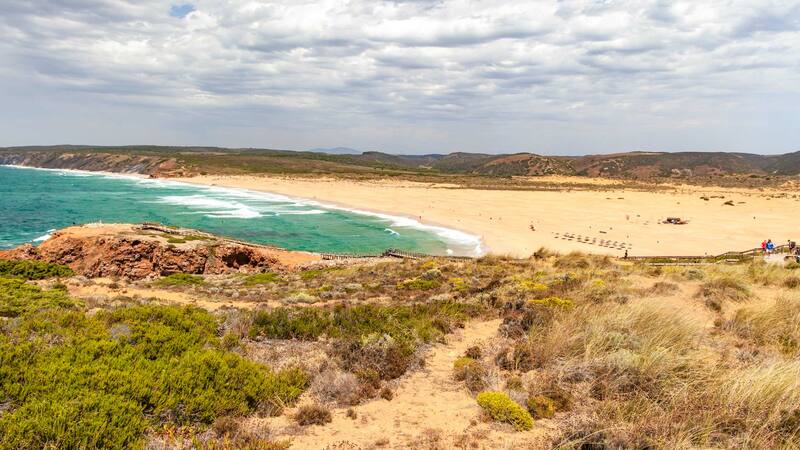 For those who don’t mind hiking on, continue to Vale Covo, a closed but stunning beach by the Tivoli hotel and finish up by the red lighthouse where you can turn inland to a handful of restaurants. The Sky-Bar at the newly renovated Tivoli also makes for a mean sunset spot in summer. Lagoa has grown hugely in the past 30 years and has become a relatively well-known wine region in Portugal (read: vineyard tasting/drinking is compulsory). 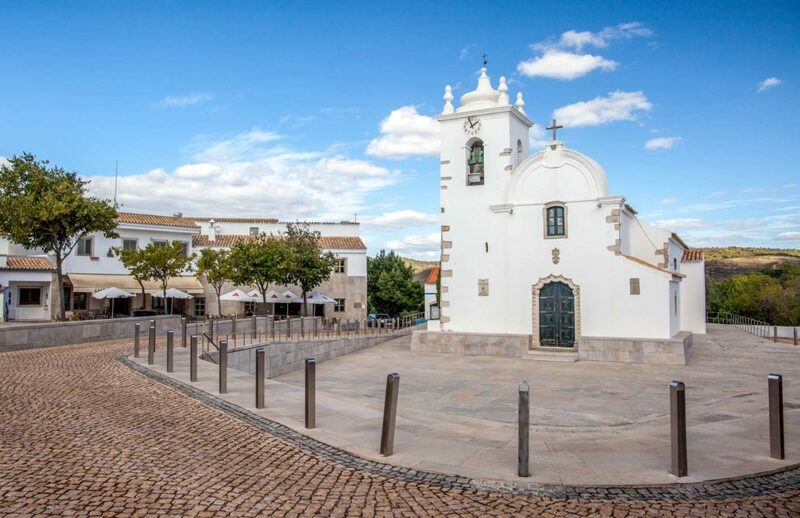 It’s located just outside Carvoeiro and Ferragudo and again, like Loulé provides a much more local town feel. Small restaurants on side alleys, such as A Tasquinha in town or A Paleta on the road to Carvoeiro offer great value menus. 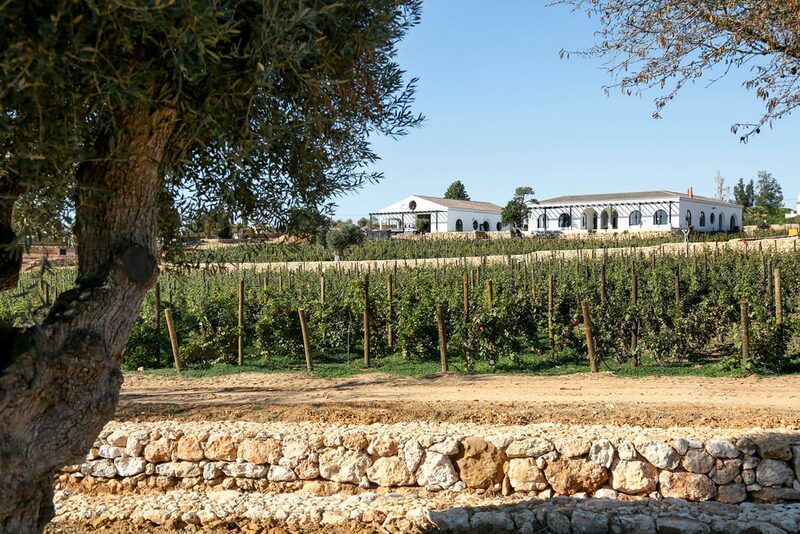 Quinta dos Santos, a recently opened craft beer and winery spot offer the chance to hit up a cellar door or grab some tapas and the converted Cooperative, now home to the ‘Lady in Red Gallery‘ serves up both wine and culture. You’ll also find my favourite water park in the Algarve, Slide and Splash, nearby. If you are around in early July then the night-time, candlelit market is a really beautiful time to visit and see the streets all lit by natural flames. Located near Porches, I love the views from the rock jutting out between the two beaches on either side. The white-washed church perched on the edge is one of my favourite places to chill with a good book and feel like I’m on the end of the world. The beach to the right is more of a pain to get down on, but it’s usually quieter than the one on the left. 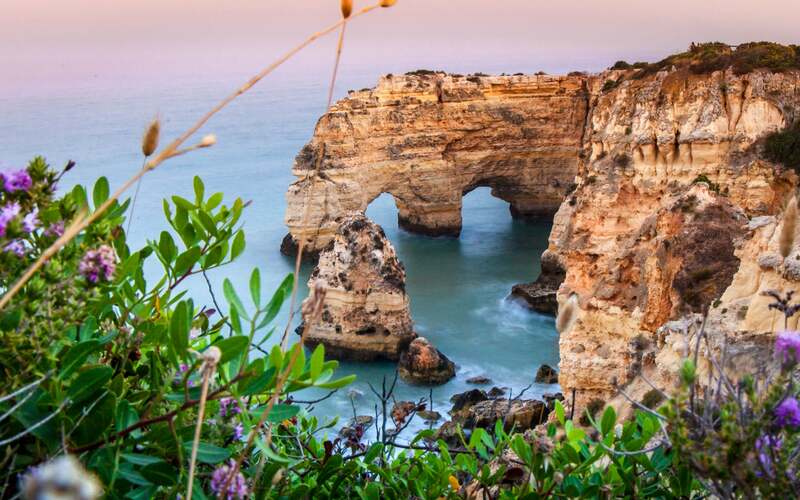 A well-deserved member of the ‘7 Natural Wonders of Portugal’ this nature park formed from a mix of sand-bars, inlets and lagoons is rife with wildlife, quiet beaches and beautiful views. If you have a daytime flight keep an eye out as it looks incredible when viewed from above. Boats from Faro will take you on tours or day trips out to some of the harder to reach parts and you can even spend the night on a houseboat here, my top pick for unique accommodation in the Algarve. The Algarve’s west coast is awash with surfing spots, empty beaches, small villages and farming valleys. 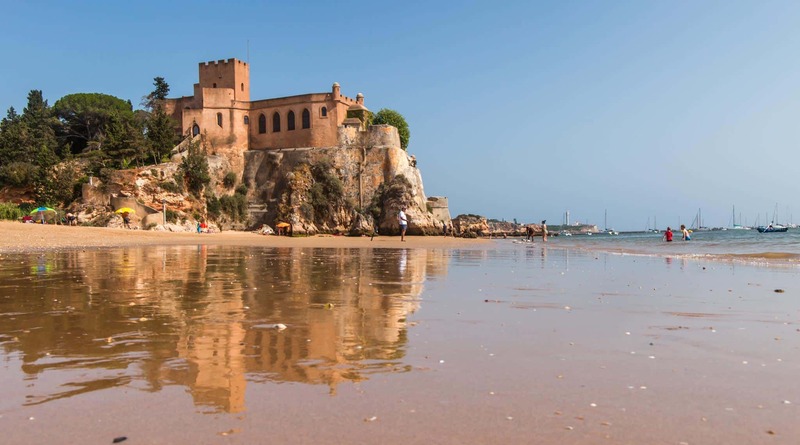 In Aljezur, the ruins of a 10th-century Moorish castle tells the history of the region; if you haven’t noticed yet, a lot of places around the ALgarve begin with Al, which highlights the history and roots of the Arabic period on the Iberian Peninsula. There are some truly incredible beaches along the coast, sand-dunes, great hikes and big waves aplenty. So few tourists venture to this part of the Algarve, and given how short driving routes around are thanks to the new (toll charged) motorways, it’s a crime. 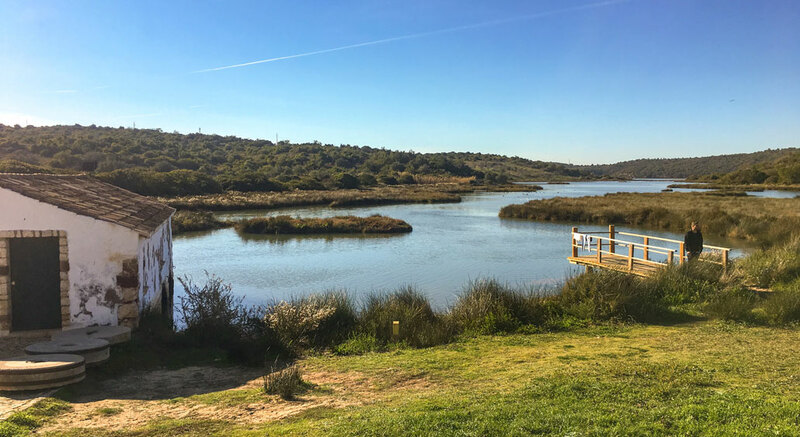 For those who like to walk, rather than resort hop, the Rota Vicentina is a vast walking trail network which crosses between the Algarve and the connecting region of the Alentejo. The Fisherman’s Trail hugs the shoreline and the views are breathtaking; an alternative inland route provides a tour of the more arid looking hills of Portugal. In fact, we have a whole week in April dedicated to the nature of the region and the website has lots of information on how to enjoy the hidden gems of the Algarve in various outside ways. This makes for a good combo on a morning or afternoon. The pretty easy walking trail through the national park, Fonte Benemola, takes a couple of hours and takes you through the greenery, running streams, and old olive presses and water mills. Nearby, the small village of Querenca upon a hill is a beautifully spotless white-washed land with a strong commitment to culture and literacy through its cultural centre. The little square with two restaurants and a church is the ideal spot for a bit to eat or to try the local almond cake, after a walk through the park. If adventure is more your thing, then the aerodrome outside of Portimao offers up Skydiving with some incredible birds eye views onto the Algarve coast. It’s also home to SevenAir, a small Portuguese airline that none of my friends around here seems to have heard about. For relatively good value fares, these tiny aircraft run regular flights to Cascais, near Lisbon, and some of the more prominent cities in the far north which also have connecting routes to Madiera. 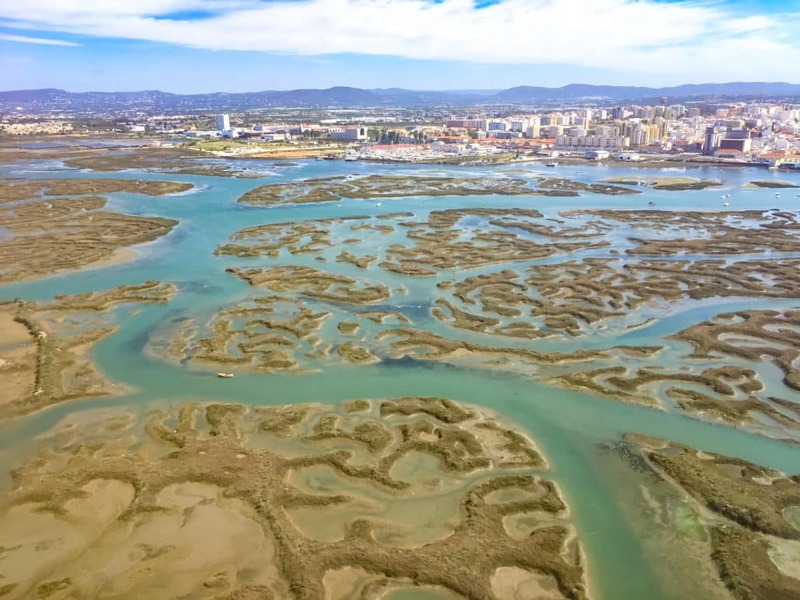 Not only does this provide a convenient alternative than going back to Faro to connect through Lisbon but the small planes, which make multiple stops on route to the north offer fantastic views of the country from the windows. The best part about the Algarve is its compact size, so it makes for the ideal road-trip to hit up many spots in a relatively short period. Whether you want a different vibe or merely a different beach every-day, there is so much more going on here than your typical brochure lead holidays would have you believe. These are seriously gorgeous places! Yes, they are perfect for a road trip. The benefit of a road trip is that you can get down your car as many times as you like and soak in your favorite spots for as much time you like. Thanks for sharing such amazing, lesser-known gems of Europe! very nice post!!! I love this post. Have you ever visited Korea? If not, do you plan to visit Korea’s archaeological site later? 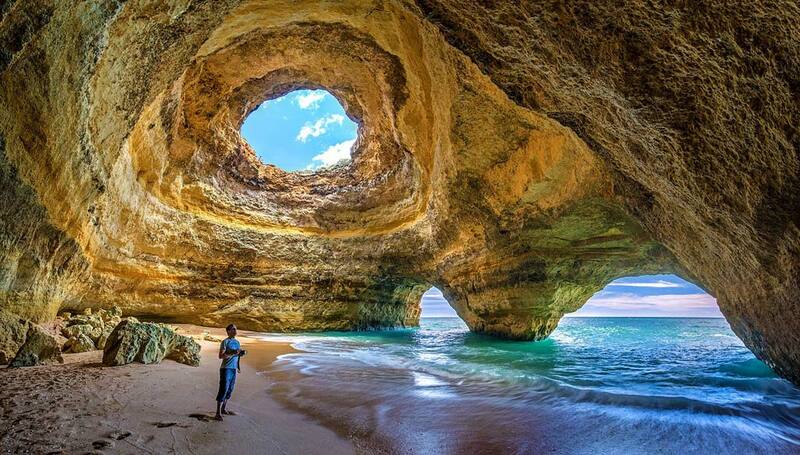 I think traveling to Algarve is like getting a Diamond. In the future, I’ll go to the Algarve thanks to your post. I really appreciate for your post. Thank you. Thanks Son, it’s a beautiful place with plenty to discover – drop me a line when you’re heading this way and I might be able to play tour guide!